This and the next post feature resources from ReactorPanel Saddle Company. I will then also included some posts with other excellent resources. Yes, I do have a slight bias toward RP saddles because I own two myself, one for each of the horses we ride (with a saddle). I’ve tested both with the Port Lewis Impression Pad, and both show no pressure spots, which is pretty remarkable, as you know if you’ve ever tested any saddles yourself. That said, RP saddles are not for everyone, nor for every horse, and any saddle that fits both horse and rider is just great! So this post is to highlight a series of YouTube videos from the RP company, and the one I suggest you start with even if you have no interest in RP saddles, is the one looking at a horse’s conformation through the eyes of a saddle-fitter…. Here’s a great Q&A article from theHorse.com. Veterinarian Dr. Joyce Harman, DVM, MRCVS, offers her response to a question about asymmetrical muscle development and how it can relate to both movement and saddle fitting issues. And be sure to note her comments in the last paragraph, “So what can you do about this asymmetry?”! 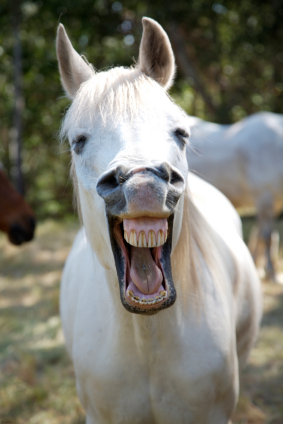 Has your horse been to the dentist lately? My three horses, Kiona, Rainbow and Prince, just had their spring appointment with Veterinary Equine Dentist Dr. Richard Vetter, DVM. (His website is very informative, check it out!) About 10 years ago I learned something about the difference between a dental specialist versus a general practitioner vet doing dentistry (floating teeth). Ever since having my eyes opened to this contrast, I make it a point to have my horses see a dental specialist at least every two years, and generally every year (or more often if necessary). (In fact, before this week’s appointment it had been two years, and now I regret waiting that long. That is, they’ve been checked by other vets every six months, and even floated some, yet were still overdue for the level of care that a specialist can provide. I know this not only because of what Dr. Vetter could show me in their mouths, but also by Rainbow’s difficulty chewing recently, Kiona’s sores inside her cheeks, and the limited side-to-side range for chewing/grinding for all three horses). For the “inbetween” appointments, in my case usually for the fall shots for example, or perhaps at a chiropractic appointment, I certainly appreciate any vet taking a look in their mouth to check on them. General practitioners are very capable of basic care, of course, but how can they be expected to do any more than this minimum without the time and training devoted to teeth as a specialty? Would you rely on your doctor to take care of your own teeth? Waiting for sharp points and sores on the inside of the cheeks to do some floating is like waiting for your horse to go lame before doing preventative care for their muscles and joints, like massage or chiropractic care. Using massage as an analogy here is especially appropriate because of the close connection between a horse’s teeth and their musculoskeletal system. Problems with the teeth, whether pain issues or problems with the symmetry and range of motion for how the top and bottom teeth meet and move, can have very direct consequences for your horse’s ability to move correctly, athletically, and comfortably. Again, I invite you to check out Dr. Vetter’s website, because you’ll find lots of information there about these topics! I had the opportunity to take an anatomy class from Dr. Deb several years ago, and to say she’s a wealth of knowledge is a gross understatement! Check out Megan’s bio and the links to her website…. We want your ideas on the tips you want to hear and if you have an idea on an expert to be on the show – click here to contact us. Listen to all of Megan’s tips here.